Intriguing, complex and addictive, Miller Harris Feuilles de Tabac Eau de Parfum Spray is a sensual fragrance that is well suited to a man’s skin. A resounding blend of rich woods, tobacco leaves and spices, Feuilles de Tabac replicates the romantic feel of Saint-Germain brasseries, a community of warmth and suave creativity. The evocative scent blends Cuban Cascarilla Oil and Pimento Berries with a cooling heart of Pine Needles and Velvet Sage, while a haunting dry down of Tobacco Leaves, Tonka Bean and Patchouli reveal a darker character. Experience a more sensual side of Paris with Feuilles de Tabac. 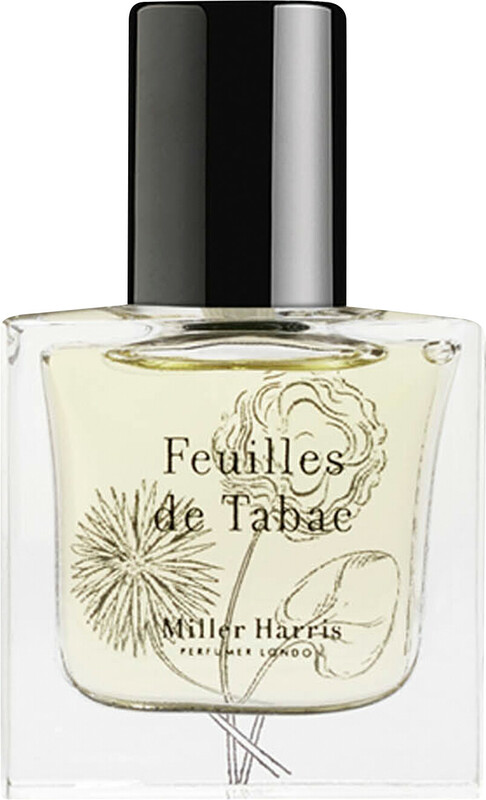 Miller Harris Feuilles de Tabac Eau de Parfum Spray is rated 4.0 out of 5 by 2. Rated 4 out of 5 by Farah from It's quite like a pale tobacco, unsmoked, from a freshly opened bag, with gingerbread spices mingling in the background. It's a very lovely smell, but not rich, complex or fascinating enough for me to justify spending the money on it.